Port El Karaoui is a modern tourist center with an international yachting port built in typical Arab style based on the medina found in most ancient cities in tunisia and the Arab world. Pass into this picturesque honecomb of alleyways, whitewashed houses, arches and patios splashed with flowers. At the Port El Kantaoui center there are cozy cafes, bars, restaurants which invite you stay a while as well as many boutiques, jewelry stores and traditional clothing stores with better quality merchandise. There is also a 36 hole golf course, charter boat hire, ATV and motor bike rental to supplement the many water sports and other activities offered by the 150 plus seaside resort hotels. "wow,what a place me and the wife to be went there to get away for just a week, just before our wedding and was blown away by the staff at the Riu ClubHotel Bellevue Park they could not do any more for. For the first time since the 2001 St. Petersburg conference opened at the magnificent Catherine's Palace in Russia, the Federation of European Carnival Cities [FECC] traveled beyond its traditional European boundaries to Africa, the motherland of humanity and thus Carnival --the first festival-- by immersing itself in the legendary hospitality of Tunisia with its 3000 years of recorded history at nearby northeastern corner of the African continent. "Tunisia, the Country of Peace, heir to a long 3000 year history as a cradle of civilizations and culture is confident that it is living today in a new, happy era. Tunisia has always been an outstanding symbol of fairness and tolerance. It seeks collaboration and solidarity with all human beings. With a great focus on the human dimension and strong belief that if ideologies fail to create a better world the cultural and the human sense can bring people closer to push away conflicts between civilizations and religions. Cultural Tourism is a strategic pointer in the industry of tourism for Tunisia as it helps enrich the experience for visitors and improve competiveness as we promote the Tunisian cultural and historical heritage. 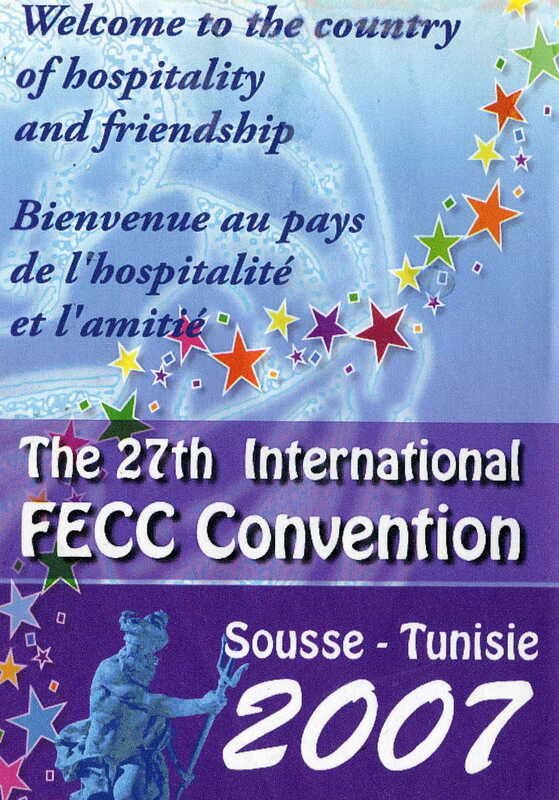 Having the FECC Carnival City congress in Tunisia, and especially Sousse improves and deepens the relationships between our societies. It shows our conviction to create more occasions to bring people together and help each other through creative collaboration between our cities, strengthening relationships of harmony and understanding. espite critical international situations, we are taking an active part to create peaceful stability in the work. Enjoy the great hospitality of the Tunisian people which comes from deep convictions and beliefs to respect the rights of everybody. "I am so pleased to express my heartfelt bliss as well as pride attending the 27th Summit of the FECC Carnival City organization in the city of Sousse. We wish you an enjoyable as well as fruitful stay amongst us, your tunisian friends and hosts knowing pertinently the underlying historical as well as the profound ties of civilization which bind us all together. Welcome to our beloved Motherland, Tunisia. The land of peace, security, tolerance and cross-cultural dialogue whose citizens venerate the holy ties of friendship, worship collective work and cherish such strong faith in the necessity of favoring peace as well as serenity all over the world. I am equally bound to pay tribute to the FECC organization of carnivals and festival-holding cities which has chosen both Sousse and Hammam Sousse as the host - cities as the location for this summit. Sousse, this city upon the coast, is a pearl of the cosmos, a cultural light, enriching the canivalesque experiments through cultural exchange, constructively renewing the working to derive benefits from the latest technologies to update and endow the carnival shows with a great sense of the sublime. Together we can make Sousse, a cradle fusing the various cultures and national civilizations into one, homogeneous, universal, salvational culture, transcending all alienating boundaries, bridging the gap between the nations of the world and strengthening their mutual trust. Aoussou Festival which is celebrating its 49th cyclical rebirth as concrete evidence of the possible, rewarding achievement and creativly moving towards the sublime whenever truthful. Sincerely wrought efforts join together and whenven nations, communities and people hail collective collaborations peacefully as well as lovinginly. 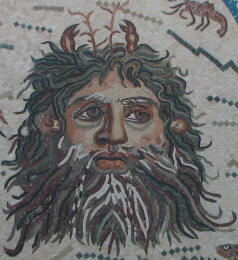 The mosaic features the powerful god of the sea, Neptune [also known as Poseidon] who remains very much alive in Tunisia, particularly at the great annual freedom celebration anchored by the Sousse Carnival. "Neptune Triumphant" was a popular theme for Roman art patrons who commissioned many mosaics during the 700 years of Roman dominance of Tunisia between the 2nd century BC and the 5th century AD. Just across the Mediterranean and within sight on a clear day is Italian island of Sicily with EU member and FECC activist organization Malta in between. 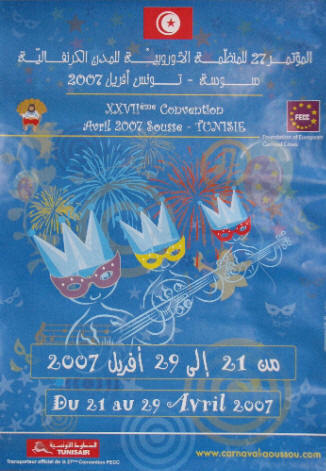 "On behalf of the steering committee of Asoussouu carnival committee, I should like to express our never, failing, never wavering loyalty to His Highness President Zenelabibine BEN ALI whose Solomon like wisdom has upgraded Tunisia enabling her to be a well- led country yearning to a universally -salvational mission, promoting universality, witnessing international cross -cultural events as a constructive partner acting for the salvation of the global village having a firm belief in the redemptive effects of solidarity and tolerance which all Tunisian citizens and dwellers enjoy daily." Women make up nearly one-quarter of Tunisia's working population. More than 10,000 women are heads of business. Women account for one-third of associations members. 35 women are presidents of national associations.